Rains have driven away most of the snow and the top layers of dirt have loosened up. The first real good shovelful won’t come until later in the month; usually the end of March, or in April perhaps. You feel it the moment the spade breaks the earth. Until then, we here at the Local continue to maintain our respective posts. Representatives head out to union members, checking in on conditions and reporting back. While things in town are considerably slow, word out of Madison says there are a lot of people digging their own graves. This year will be a busy one. With the increased amount of business, we’ll be able to afford a higher quality of decoration around here at the Front Office. 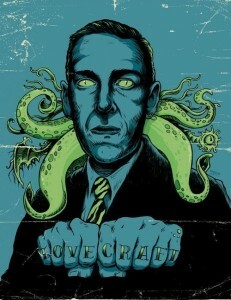 We’re glad, since we recently discovered the artwork of Ghoulish Gary. Ghoulish Gary has a distinctive style that seamlessly melds the bizarre with the realistic, producing some wonderful collaborations of imagination and reality. 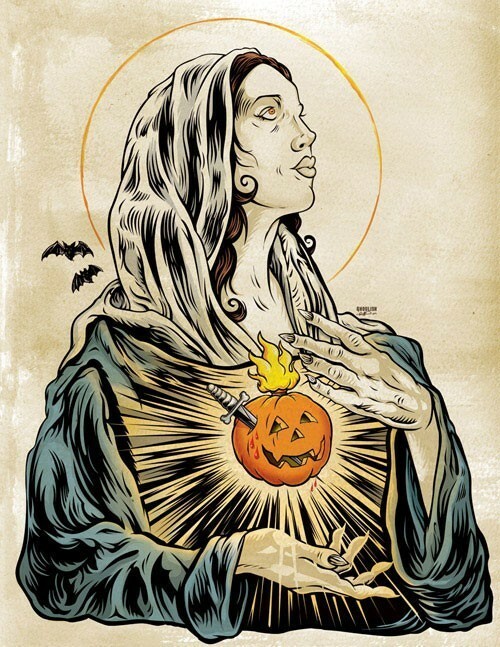 This is a print from Ghoulish Gary’s ‘I Remember Halloween’ Show shows that what many of us here at the local have – a heart for Halloween. Since we don’t discriminate at the Local, the question of religion never comes up. We don’t know if any of our undead individuals subscribe to any particular faith, or if this Immaculate Lady of Hallow’s Eve is a particular figurehead of a system of belief. It’s quite gorgeous, however. You can have this print and dedicate how much you believe in Halloween. As we progress into the year, Strange Jason has been talking more about an upcoming project and how he has been researching into out of North America for possible fellows. Taking it international or making everything local, he says. Maybe when he does research into Brazil, he can bring us back some Coffin Joe material. José Mojica Marins created the maniacal character Coffin Joe, a fiend looking for his perfect bride. As a filmmaker, Marins has developed a strong low-budget style to his movies. Here, Ghoulish Gary pays tribute to him. 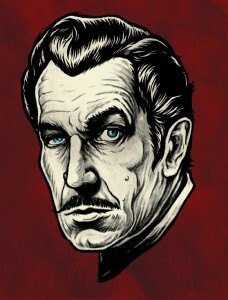 Similar in generating an aura of spooky and macabre like Coffin Joe, we have the master himself, Vincent Price. Always a charmer, the latest person to fall under Mr. Price’s good looks is miss Poinsettia, who has been watching the Dr. Phibes movies every day for the last week now. We think her father tried to tell her that Mr. Price has been dead for over fifteen years now. But when has death ever stopped anyone? If she saw this print by Ghoulish Gary, I’m sure she would sell whatever she could to ensure it would be hanging from her wall. Bernie said that money is tight at the moment, even with the upcoming work. Maybe he’s saving for something? 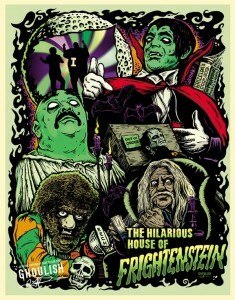 If you remember the Hilarious House of Frightenstein, chances are you’re Canadian (just like Mr. Ghoulish Gary.) Chances are that you loved it, too. 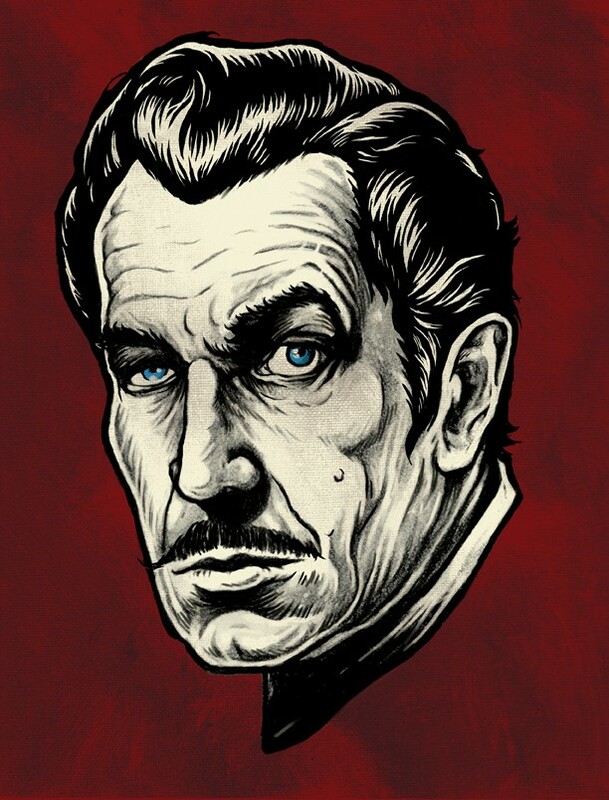 Vincent Price did the opening narration, but you see Igor, the Wolfman and Count Frightenstein in this limited edition print. A must have for any spooky Canuck. Ghoulish Gary’s depiction of Local favorite Howard Philips Lovecraft is appropriate since a lot of the author’s memorable horrors came up from the depths. The lips and eyes might have been plucked off of Dagon himself. One must commend Gary. Providence, being a seafaring town, might have been an inspiration. We don’t know if Gary has ever been. Maybe Strange Jason can give him a guided tour. Find Ghoulish Gary’s site over at www.ghoulishgary.com, where you’ll learn that he is Gary Pullin, who has been the Art Director for Rue Morgue Magazine for the last ten years! Don’t forget to go over to his Etsy store. And remember, all artwork copyright Gary Pullin 2011. Pictures posted with permission. Thank you, Mr. Ghoulish Gary. And than you, reader, for visiting GdL for another Tuesday uEtsy.